“No limits” is the theme for this relationship. Sun in Aquarius’ focus on the future blends nicely with Moon in Sagittarius’ need for adventure. Together, these two can push the boundaries without getting bogged down in heavy emotions. Both of these signs are able to approach life with perspective and the ability to release and move forward when needed. Sun in Aquarius is always interested in what’s outside the box. 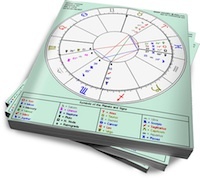 Conventional rules have little interest for him, although this Fixed sign can stubbornly insist on his personal rules, even if those consist of a 180 degree rejection of what is supposed to be done. Sun in Aquarius’ partner will have the most success with him if she remembers that his instinct is to rebel against what everyone else is doing. He can be a loyal partner (albeit somewhat cool and detached) as long as the structure of his relationship conforms to what he wants. Moon in Sagittarius needs room to move. Cozy, domestic stability is not her cup of tea, and she’ll always need something new to look forward to. Her ideal partner would be a companion in her adventures, whether they consist of traveling, experimenting with exotic dishes or exploring radical new belief systems. Moon in Sag’s hunger for more (in all areas) makes her a fun, lively partner whose emotional demands are excessive, but not invasive (she’s too busy moving forward to become obsessive). Moon in Sag will feel comfortable with Aquarius’ willingness to try anything once. Sun in Aquarius will be encouraged and motivated by Sagittarius’ buoyant excitement about whatever area of interest he opens up. Aquarius’ stability will keep Sag from flying off the rails, while Sagittarius’ passionate enthusiasm will warm up his sometimes chilly approach. Their mutual ability to keep progressing should keep this relationship exciting and full of positive energy.